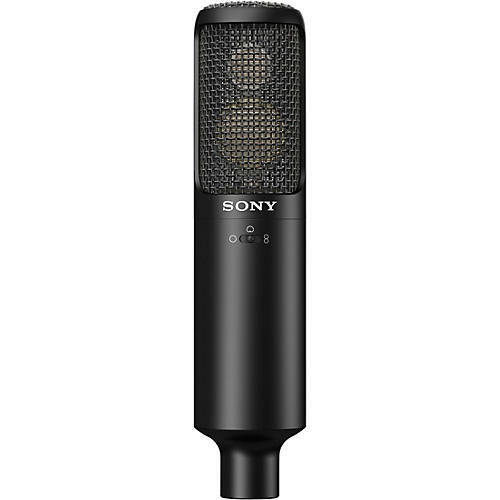 In 1992, Sony released the C800G valve capacitor microphone which is still one of the most coveted and expensive microphones on the market. With its bright, detailed sound and unique appearance, the C800G has been a staple in high-end studios capturing vocals that demand intimacy and detail across all genres. Continuing in the tradition of the C800 is Sony's C-100 mic. Featuring a dual-element capacitor, highpass filter and three switchable polar patterns, the C-100 is capable of recording high-resolution audio from 20Hz-50kHz. Its dual-element design combines one condenser and one electret condenser capsule for the utmost detail across the mic's broad frequency range.This range makes the C-100 is a versatile mic that doesn't discriminate when recording either a male or female vocalist. In each case, you can expect smooth, airy vocals that will sit perfectly in your mix. The C-100's three polar patterns allow you to switch between cardioid, omnidirectional and figure-8. This offers you the flexibility to record different sound sources with different miking techniques to get the best recordings possible. A highpass filter switch cuts unwanted low frequencies and a 10dB pad switch adds more headroom to avoid any distortion from transient peaks.